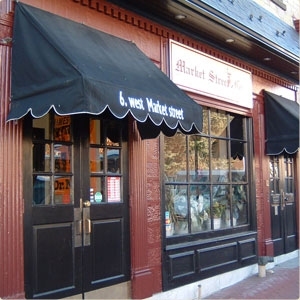 Market Street Grill is quickly becoming West Chester's favorite eclectic downtown eatery. It features Chef Darla Riccetti and owner-operator Kerry Greco of High Street Café. You will enjoy the friendly and casual atmosphere that invites friends to meet and enjoy the excellent menu selections. Market Street Grill is the winner of Main Line Today's Best Breakfast. This is the perfect place for an early morning business meeting or enjoy on the weekend with the family featuring; specialty omelets with crab and spinach, smoked salmon and fresh dill cream cheese. If you're really in the mood for something special try the Brown Sugar Swirl Stuffed French Toast with Caramelized Bananas, Cream Cheese and Walnuts. Lunch features a great selection of salads, wraps and specialty sandwiches. Citrus Chipotle BBQ Pork, Crab Cake with Old Bay Remoulade, Ahi Tuna Wrap also featuring classics such as Smoked Turkey Breast and grilled chicken. An excellent value with all lunch items under $10.